Hello! Okay, I'm officially in love. With these baby blue mules. Recently, the color blue has captured my heart once again and when I spotted these baby blue mules while shopping online, I knew that they had to be mine. I purchased these baby blue mules on Poshmark, my latest obsession. These shoes were originally from Nasty Gal and retailed for $100 + shipping. I purchased them on Poshmark, new in box, for just $50 (including the shipping costs.) Score! For this look, I paired the baby blue mules with a blue sunflower-printed dress. I scooped this dress up at Forever 21 a little over a month ago for just $15 and am so happy that I did. 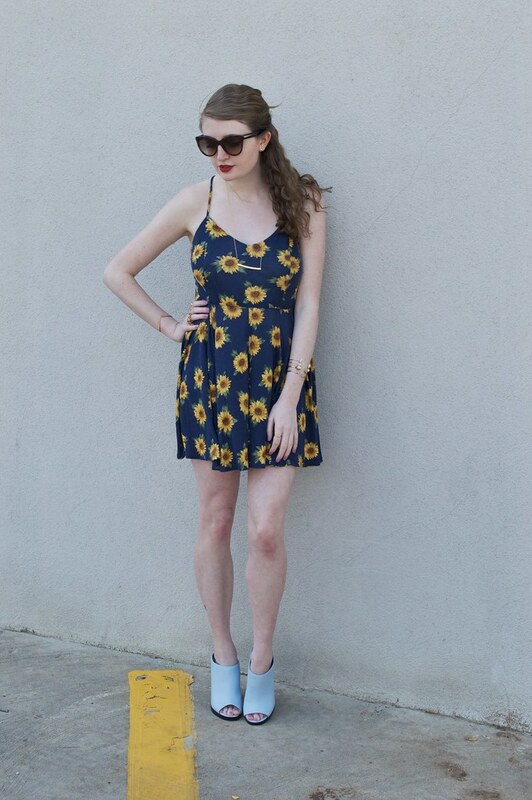 The vibrant sunflower print, trendy blue color and breezy silhouette make it my ideal spring sundress. I accessorized with dainty golden jewelry and a show-stopping pair of shades. SmartBuyGlasses recently sent me these Givenchy sunglasses to style on my blog and I've fallen head over heels in love with them. The classic shape, versatile color and gold detailing have me reaching for these sunglasses almost everyday as I head out the door. Want to update your spring/summer wardrobe with a stunning pair of sunglasses like mine? Head on over to SmartBuyGlasses to browse their fashion-forward assortment of sunnies. SmartBuyGlasses offers a wide range of different popular brands like Ray-Ban, Police, Fendi, Burberry and Celine.